A forty-year old kindergarten teacher is terminally bored with her banal middle-class existence. When she becomes convinced that her five-year-old student is a budding poetic genius, she decides to nurture his talents in a reckless and questionable manner. 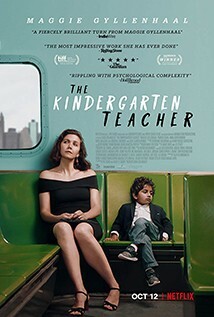 Married mother Lisa Spinelli (Maggie Gyllenhaal), teaches at a kindergarten in Manhattan, and aspires to be a poet. She studies poetry in an adult education class, but her instructor Simon (Gael Garcia Bernal) thinks her work is derivative. When one of her students Jimmy (Parker Sevak) starts reciting his own poetry, she writes it down, shows it to Simon - who likes it - and she becomes more and more interested in the boy. Adapted from a 2014 Israeli film by the same name, this is a haunting and sometimes uncomfortable dip into the mind and desires of a woman who feels stifled by the life she’s chosen.